The resignation of Ingushetia’s President Murat Zyazikov was an event which had been anticipated. 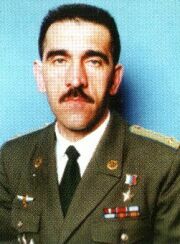 The experts who predicted it assumed that Zyazikov’s lack of talent as a leader in all departments – law enforcement, civil society, human relations – was an important contributing factor in Ingushetia’s transformation from a relatively peaceful republic under Ruslan Aushev into the “hottest” and most volatile region of the North Caucasus. To understand this required no special effort or knowledge. It was logical to suppose that the Kremlin knew that the situation would have to be changed, for if Zyazikov were to remain as Ingush President there was the risk of an increasing avalanche of crises. Signs that Moscow was thinking about the option of replacing him began to appear this summer. The initial rumours that he was about to resign were followed by the revival of the long-forgotten idea of merging Ingushetia and Chechnya. The upsurge in the activity of underground armed groups in Ingushetia obviously forced the federal centre to hurry in coming to a decision. It has long been known that the Kremlin does not like to sack regional bosses under the pressure of circumstances. This style of governance emerged under Putin, who views as a personal insult any attempt to implicate him in decisions relating to changes of personnel. In the present instance, however, there could be no procrastination, as the spectre of a “second Chechnya”, as Ingushetia is now often called, was looming on the horizon. It is highly probable that the option of merging the two republics had to be abandoned because of its cumbersomeness and the opacity of its consequences. A procedure requiring a large amount of time and effort did not promise swift and unambiguous results, as it was clear that a considerable number of Ingush would organize themselves and endeavour to obstruct the unification process, trying to sabotage it in every way they could. In a situation where Ingushetia was fast becoming a large-scale military polygon in which attacks on military installations, federal troops and members of the law enforcement bodies were taking place day and night, and where local police and government officials were coming under gunfire, the Kremlin, as it often does, administered a palliative – a set of temporary, short-term measures that promised a quick but limited result. Despite the jubilation with which the Ingush greeted the appointment of Yunus-Bek Yevkurov as temporary acting head of the republic, his selection came as a surprise. Even though he is not a total unknown, he cannot be said to possess anything resembling a public profile. This is understandable, given his work in the Russian defence establishment. But it also points to the fact that he is a purely military figure, without the slightest experience of managing civil structures, and confined once and for all within the limits of his chosen profession. What tasks can be assigned to a high-ranking officer who is used to planning and conducting military operations, to leading officers and soldiers, not civilians? Moreover, it needs to be borne in mind that the only method of organization a military man with a service record like that of Yevkurov knows is an iron discipline within which the orders of superiors are not discussed but are carried out to the letter. This is the kind of obedience he will demand from his subordinates. Of course, in the absence of any firm information we can only speculate, while the reality, as always, will be different. But it is important to understand the motives of those who have sent Colonel Yevkurov to pacify Ingushetia. This step probably means that a new tactical model has been chosen, one in which the Chechen experience is taken into account. While all is still being staked on effective methods of law enforcement, it now looks as though the authorities are placing their hopes not on special operations but on direct military intervention. Yunus-Bek Yevkurov can give a clear and dignified response to the fighting units of the underground resistance by drawing a proper front line and by forming his own army, as Ramzan Kadyrov did. Instead of deploying in the houses and streets, abducting people, his men will go into the forests and mountains with weapons in their hands, and achieve a brilliant victory. How far are they justified, the federal government’s expectations that this new approach will prove effective? In answering this question it should be remembered that the Kadyrov clan, with its outstanding repressive talents, also has a very clearly defined political programme. Like Kadyrov Senior, Kadyrov Junior has a vision of Chechnya’s political future. And this vision is the source of the political will that really drives the huge repressive mechanism. It is hard to say how far Yevkurov is prepared to play the role of Ingushetia’s pacifier. Is he capable of offering a political solution, not just a military one? If he is only called upon to fulfil military tasks, then, in a territory where no one has declared war, military operations are bound to come into conflict with the criminal code. And then the situation will once again start to unfold according to the familiar scenario, but in a new and aggravated form. Also, if Yevkurov does turn out to be a simple executor of repressive decisions, his lack of understanding of the interests of his own people may play a cruel joke on him, as was the case with Zyazikov. If, on the other hand, he listens to the pleas and demands of his compatriots, this may have a very unfortunate effect on the implementation of the tasks on his agenda. The photograph is borrowed from the website Warheroes.ru.